As a full service production company we strive to bring you feature films, shorts, web series and television shows that Inspire Ideas within you! We love movies. We love great stories. We love making you laugh, sometimes we love to make you cry. Most of all, we love to share the human experience and help one another understand each other a little bit better, escape your stressful life and spread love, joy and peace in this world. We offer our services as a line producer to help your next project come to life. Let us handle all the paperwork, permits, hiring, organizing, all of it, so you can focus on the creative aspect of your film. Starring Amy Smart, Taymour Ghazi, Parker Gray and Dee Wallace. ALWAYS REMEMBER ME - You’re invited to Amy’s 7th Birthday. For the 18th time. Shot on 16MM Kodak Film. Premiered at HollyShorts Film Festival where it won the Kodak Honorable Mention. Coming soon to a festival near you. Watch the trailer here! BAG OF WORMS - Written, Directed and Starring Grace Rowe! Coming soon to a festival near you! WHAT METAL GIRLS ARE INTO - Watch the Trailer HERE! This dramatic short film came to life over a two day shoot in June of 2016. With Gabrielle Stone making her directorial debut as co-director of this important short film, we knew we were creating something special. Since the film premiered at the Pasadena Film Festival in March of 2017 its enjoyed immense success. Nominated for Best Short and Gabrielle Stone for Best Actress, we were honored to watch Gabrielle win! Next up we screened at the NoHo CineFest and were thrilled to be nominated for Best Dramatic Short, Best Director and Best Actress and even more excited when we won Best Dramatic Short. 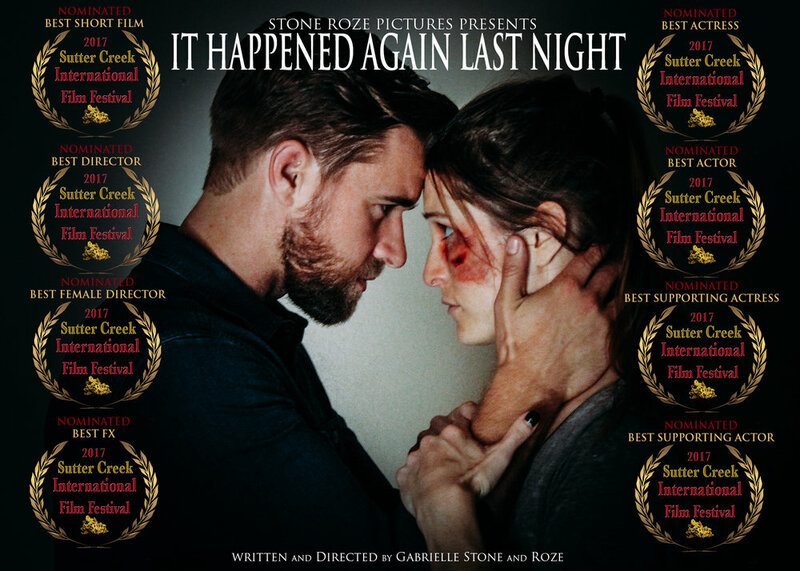 The prestigious Beverly Hills Film Festival honored, "It Happened Again Last Night" next with Best Short and awarded Gabrielle with Best Actress of the entire festival. See below for a full list of awards and nominations. 16 Festivals, 22 Nominations, 12 Wins.